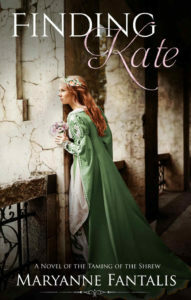 Maryanne Fantalis’ book “Finding Kate,” based on the Shakespeare play, is on sale now. J.K. Rowling was trapped on a delayed train when the idea for “Harry Potter” came to her. For E.B. White, author of “Charlotte’s Web,” inspiration struck when he found a large, intricate cobweb in his house. All J.R.R. Tolkein needed to start “The Hobbit” was a blank piece of paper and a made-up word. For Maryanne Fantalis, the great “a-ha” moment came from a night of Shakespeare under the stars. Seven years ago, the author and CU Boulder writing and rhetoric lecturer attended a production of “The Taming of the Shrew” so inspiring that it ignited the idea for her next novel. The book, “Finding Kate,” was released in print and e-book form earlier this year. Fantalis has attended the Colorado Shakespeare Festival every summer since 2006. In fact, she and her friends have made their girls’ night out at the Mary Rippon Outdoor Theatre an annual tradition. She’d always written off “The Taming of the Shrew,” assuming its narrative didn’t really fit into modern times—but when CSF planned to stage it in 2010, she decided to give it a try. Fantalis says she saw things in the play she’d never seen before—namely that Kate isn’t so much a “shrew” as a woman grown understandably bitter from a lifetime of being given short shrift. “She’s developed this armor of defensiveness,” Fantalis says. “Everybody around her is so awful to her. She and her sister, they have this ongoing war of words. When her father sees them arguing, he immediately assumes it’s all Kate’s fault. This gets carried out into the neighborhood; everyone treats her that way. For the first time ever, Fantalis also saw in Shakespeare’s words the unfolding of a real love story—not the story of a man wielding power over a woman without her consent. She credits director Stephanie Shine and lead actor Augustus Truhn for turning Petruchio’s “taming” into a sweet plea for Kate’s hand. She wanted to write a book based on this newly framed relationship between Kate and Petruchio … and she wanted to set it in 1485, just as the sun set on the Middle Ages and the Wars of the Roses. In this new era, Richard III had fallen, Henry Tudor was on the throne, and the English Renaissance had begun. It may seem counterintuitive to set a Shakespearean story in a period before Shakespeare was born. But Fantalis, a scholar in medieval literature and history, points out that the term “shrew” actually comes from the Middle Ages: It was a character archetype in mystery plays and literature from that time. Fantalis has always been fascinated by the way Shakespeare traveled several centuries back in time for story ideas but simultaneously created female characters who were ahead of their time. She’s planning for “Finding Kate” to be the first in a series of historical fiction focused on the women of Will. Other books will focus on female protagonists in “Much Ado About Nothing,” “Twelfth Night” and “Measure for Measure,” among others. Despite the historical setting she uses, Fantalis believes any contemporary woman can see a bit of herself in Shakespeare’s leading ladies. “The Taming of the Shrew” returns to the Rippon stage starting Sunday, June 11.